This 'thangka' is distinctive for its use of rich and intense colour, predominantly blue, gold and green. The central deity holds a begging bowl containing a sprig of the medicinal myrobalan plant. 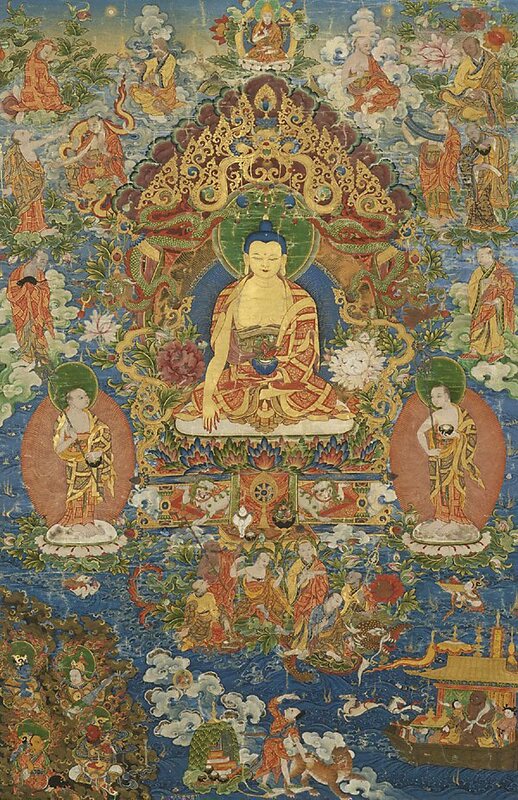 Seated on a lotus pedestal supported on a lion throne, the Medicine Buddha wears the patched robes of a monk and is accompanied by his disciples and the 18 'arhats' or 'saints' of Tibetan Buddhism. Directly above the Buddha's head is Tsong Khapa, an important reformer of Buddhism in Tibet and the founder of the Gelukpa or 'Yellow Hat' order of monks. A 'thangka' such as this may have been commissioned to commemorate a significant occasion or life ceremony, to accrue merit for the donor or as homage to the abbot. The dedication of an image of the Medicine Buddha may suggest that it was commissioned at a time of illness, or perhaps as a wish for good health. Interestingly, this 'thangka' bears an inscription which indicates that it was painted at the Tsedong monastery in Tsang, Central Tibet, for Ride Gdong Sprul Sku, who was the reincarnated abbot ('lama') of that monastery. Although it is not known who commissioned it and what their relationship was to the abbot, it is not unusual to find 'thangkas' with dedications or inscriptions recording the names of donors and the circumstances surrounding the commission. This inscription reminds us of the 'thangka's' donative function, as works created as a tribute designed to bring merit to oneself and others. The Asian Collections, AGNSW, 2003, pg.64.